1. Set a rack in the middle shelf of the oven and place a second rack on the top shelf. Preheat the oven to 200°F. Line 2 baking sheets with parchment paper and set aside. 2. In a large metal bowl and using an electric mixer set at low speed, beat the egg whites and cream of tartar until foamy. Add the salt, increase the mixer speed to medium-high, and continue beating until soft peaks form. Beat in the vanilla. 3. Gradually, add the superfine sugar, 1 tablespoon at a time, beating until the meringue forms stiff, glossy peaks. 4. Sift the confectioners’ sugar, a second time, over the meringue. Using a rubber spatula, carefully fold the sugar into the meringue just until no streaks of sugar remain. Do not fold any more than is necessary. as overmixing will deflate the meringue. 5. Spoon the meringue into a large self-sealing plastic bag. Use a sharp pair of scissors to snip 1/2 inch off from one corner of the bag to form a makeshift piping bag. 6. Pipe 12 meringue ghosts onto each lined baking sheet. 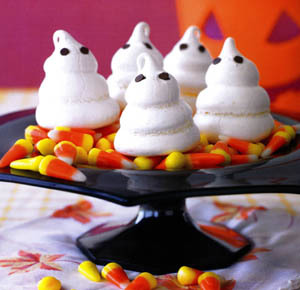 Hold the bag upright and squeeze the meringue, forming a wide base, a slightly smaller middle, and a curled tip (almost as if you were piping a soft-serve ice-cream cone) to form a chubby, upright ghost shape. Press two chocolate chips (flat side out) into the face of each ghost to form eyes. 7. Bake the meringues for 2 hours, or until crisp. Baking the meringues for a long time at a low temperature ensures they will remain crisp and very white. If the meringues start to color, reduce the oven temperature to 175°F. When the meringues are crisp, turn the oven off and allow them to cool in the oven for at least 2 hours, but preferably overnight. What a fun recipe. I know a place where you can get an ounce of cream of tartar for 99 cents!